The first time was before they were not even famous. They were playing at a small lounge in downtown Orlando for $10 a ticket. They played their set & played hits like "Please Be Mine", "Year 3000", & "Mandy." After they had a section away from the stage to line up for a M&G. We met them & they were so awesome. They signed my 8x10 photo for me. Next time was at the DC Games, only no photos were allowed because Big Rob was closely watching. I got autographs from Kevin & Nick though. Joe was busy doing Camp Rock interviews with Demi Lovato. When Nick came to sign my brother's book, he saw I was wearing an old-school Jonas logo shirt & looked at it, looked at me, and smiled. I dont know if he remembered or anything, but that was nice. 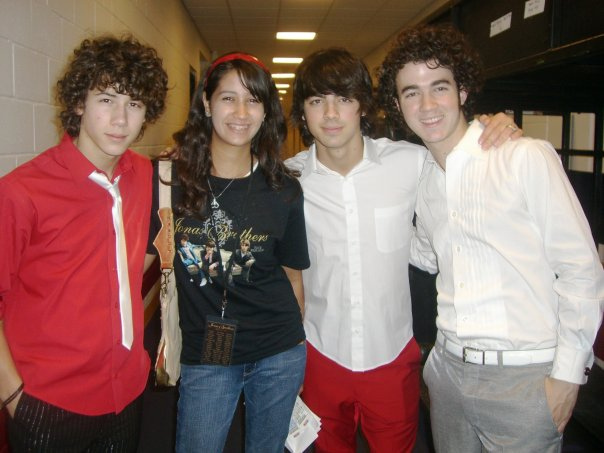 I met them later that year at the Best Of Both World Tour. We went down to the location of the M&G and got there late. The M&G was over & they were leaving out the door and said "Hi" as they walked past me. My boss caught their attention & they did a 180-degree turn and came back. I got my Jonas Brothers CD signed and posed for the photo. Kevin was super sweet & outgoing, Nick & Joe were pretty quiet but still cordial. They then went to get ready to head on stage."